Chip Somodevilla/Getty ImagesHope Hicks and Steve Bannon are two high-profile examples of President Donald Trump’s staff turnover. 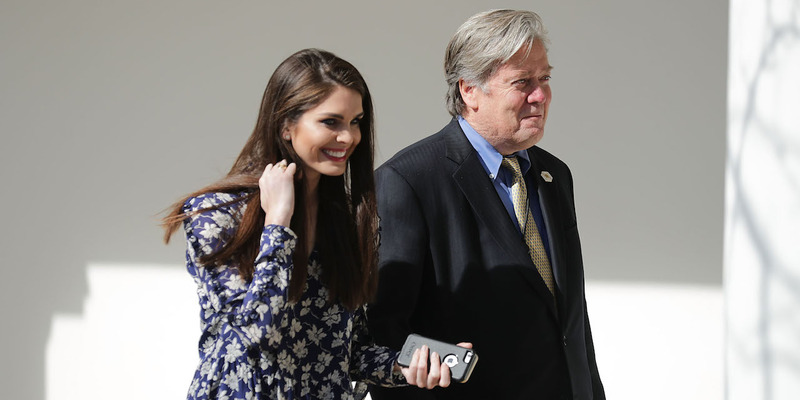 The first year of President Donald Trump’s White House has seen more firings, resignations, and reassignments of top staffers than any other first-year administration in modern history. President Donald Trump rocketed to reality TV stardom for his love of two words: “You’re fired!” And he seems to have brought his penchant for terminating employees to Washington. 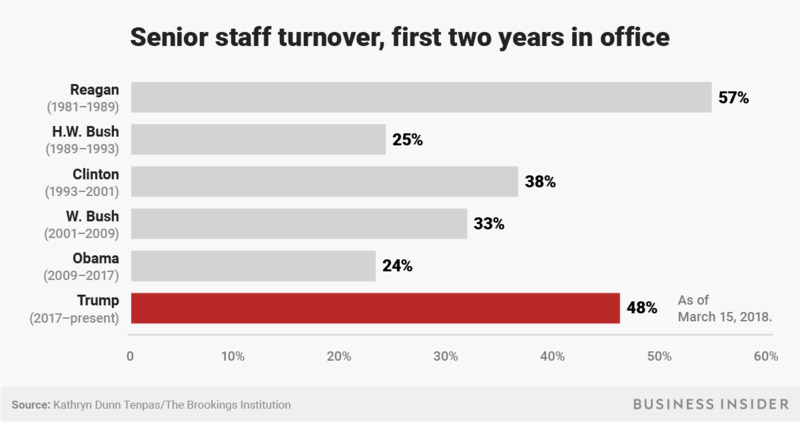 The president’s senior staff turnover rate during his first year in office was three-times higher than both Presidents Barack Obama and Bill Clinton – and more than five times higher than President George W. Bush, according to a recent Brookings Institute report. 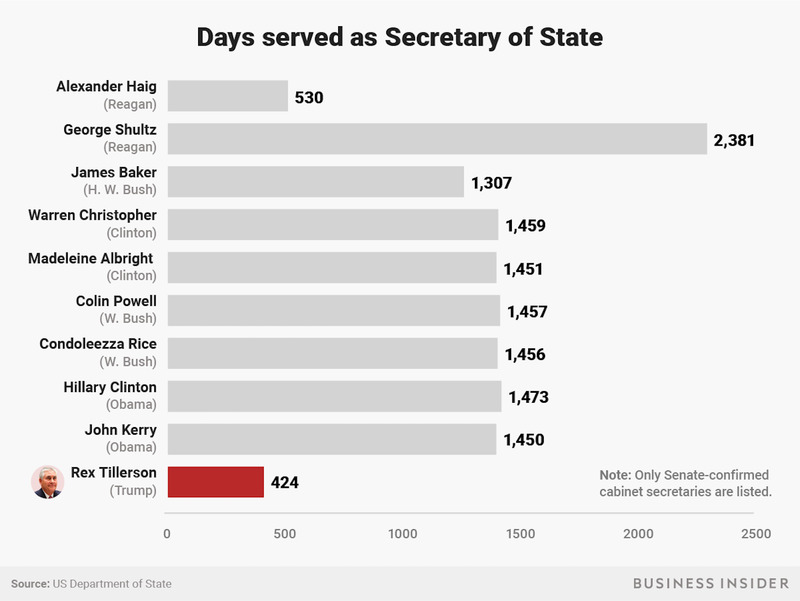 And Trump’s cabinet turnover exceeds that of any other administration in the past 100 years. Secretary of State Rex Tillerson, fired via tweet; former Secretary of Health and Human Services Tom Price, ousted after the media exposed his extravagant taxpayer-funded travel habits; John Kelly, the former Secretary of Homeland Security who was promoted to White House chief of staff; and scandal-plagued Secretary of Veterans Affairs David Shulkin all served the shortest terms of anyone in their positions in recent history. 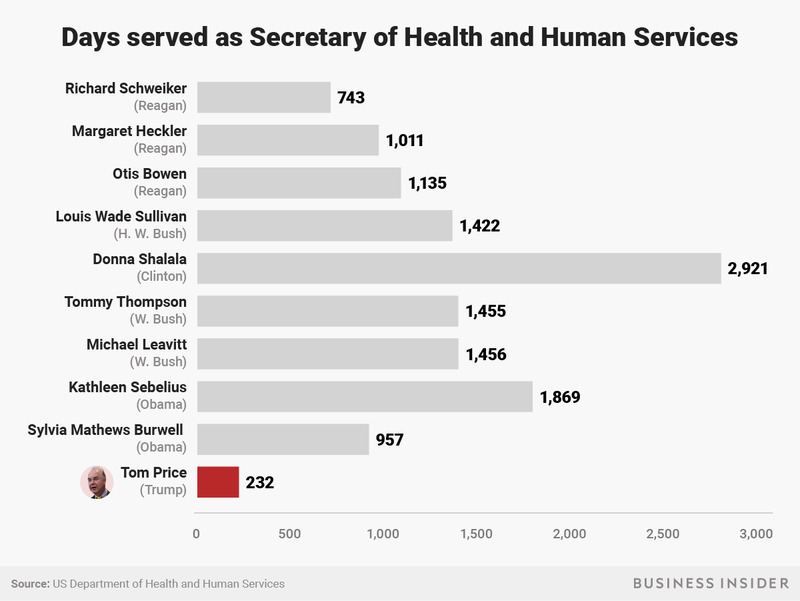 And if the past is any guide, turnover will jump in Trump’s second year in office. 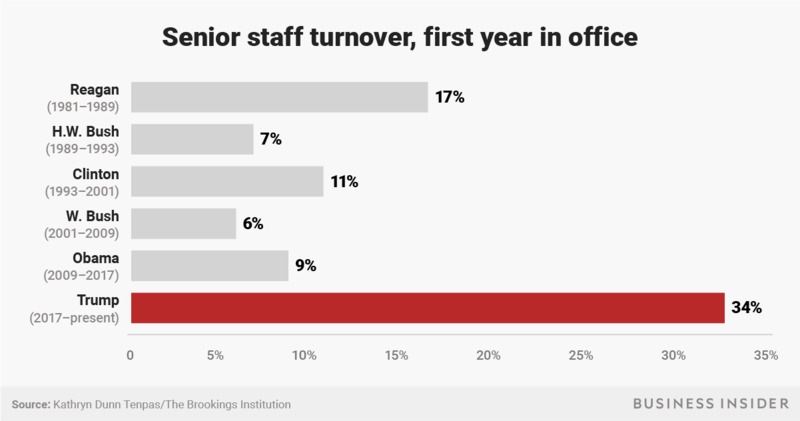 Since Trump’s one-year mark in January, turnover among top staffers has grown to 48% (as of March 15) – 31 of the 65 officials the Brookings report tracked (not including cabinet secretaries). 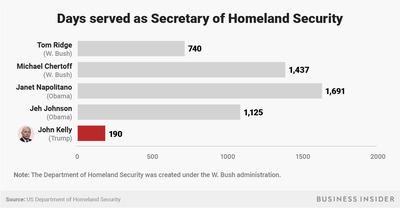 So Trump’s first 14 months in office have now seen more departures or reassignments than the first two years of the last four presidents’ entire first terms. 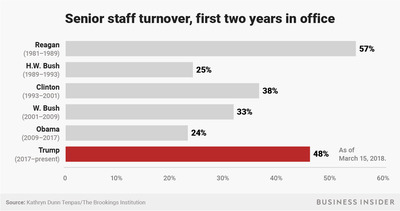 Kathryn Dunn Tenpas, a senior fellow at Brookings who authored the think tank’s report, says especially high rates of turnover increases disruption and inefficiency, deprives the administration of outgoing officials’ personal networks and political connections, and can have a domino effect, as top aides to departing staffers often follow them out. Trump’s senior staff turnover (not including Cabinet secretaries) in year one was over three times higher than Obama’s. 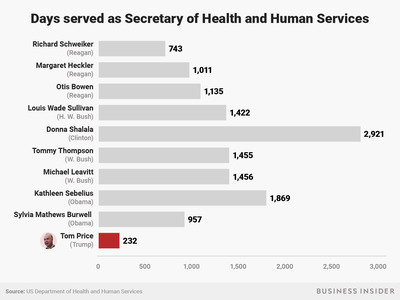 Senior staff turnover (not including Cabinet secretaries) during Trump’s first year was higher than the last four presidents’ first two years, but hasn’t reached former President Ronald Reagan’s yet. 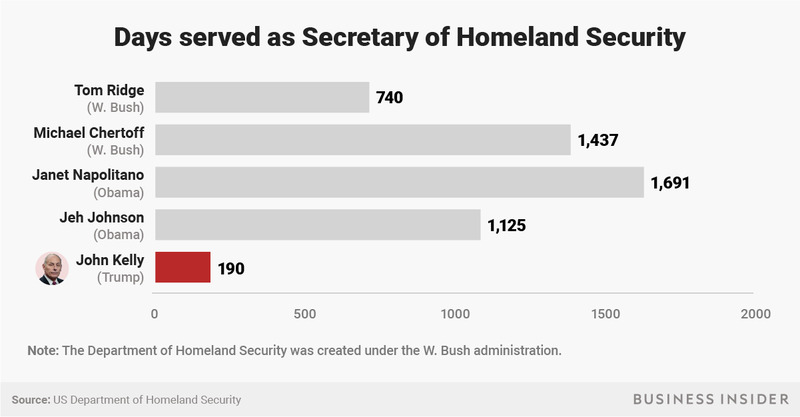 John Kelly left the department of Homeland Security to become White House chief of staff in July, making his tenure at the helm of DHS the shortest since the agency’s founding in 2002.